Magic Ornament:Has MOTION,Light and PLAYS SONG/SOUND. Press the button to hear "We Wish You a Merry Christmas" and see the scene illuminate as the train circles and Santa greets Children. Measures approx. 3 3/4" x 5" x 3"
New, mint condition in original box, never used. 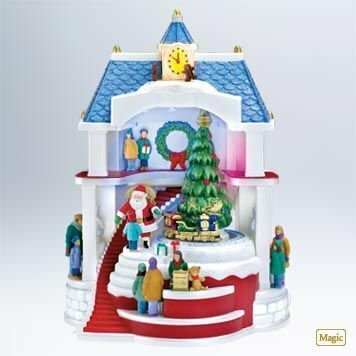 Items Similar To "Hallmark 2011 SANTA COMES TO TOWN- Sound,Lights,Motion Christmas ..."